Ricotta (pronounced [riˈkɔtta] in Italian) is an Italian whey cheese made from sheep, cow, goat, or Italian water buffalo milk whey left over from the production of other cheeses. Like other whey cheeses, it is made by coagulating the proteins that remain after the casein has been used to make cheese, notably albumin and globulin. Ricotta (literally meaning "recooked") protein can be harvested if the whey is first allowed to become more acidic by additional fermentation (by letting it sit for 12–24 hours at room temperature). Then the acidified whey is heated to near boiling. The combination of low pH and high temperature denatures the protein and causes it to precipitate, forming a fine curd. Once cooled, it is separated by passing the liquid through a fine cloth, leaving the curd behind. Whey protein is a kind of milk protein  but there are numerous other milk proteins. Whey itself is less than 1% protein by weight. This means ricotta production is a low-yield process, considering the amount of whey required to produce it. The whey is heated, sometimes with additional acid such as vinegar or lemon juice to catalyze the coagulation through heat of albumin and globulin in the whey. The whey is heated to a near-boiling temperature, much hotter than during the production of the original cheese, of which the whey is a remnant. The original ricotta is made of whey with the addition of a small amount of milk, but more recently ricotta has been made of whole milk as well. Whole-milk ricotta is primarily popular in the USA, where whey ricotta is known by the name ricottone. Ricotta di Bufala Campana and Ricotta Romana are notable varieties produced in Italy and protected by the European Union's Protected Designation of Origin regulation. Ricotta di Bufala Campana is made from the whey left over after the production of Mozzarella di Bufala Campana, a protected variety of buffalo mozzarella. Ricotta Romana is made from the whey of sheep milk. Ricotta forte is a very soft variety from Apulia sold in jars. Fresh ricotta can be subject to extra processing to produce variants which have a much longer shelf life. These production methods include salting, baking, smoking, and further fermentation. Ricotta salata is a pressed, salted, dried, and aged variety of the cheese. It is milky-white and firm and used for grating or shaving. Ricotta salata is sold in wheels, decorated by a delicate basket-weave pattern. Ricotta infornata (baked ricotta) is produced by placing a large lump of soft ricotta in the oven until it develops a brown, lightly charred crust, sometimes even until it becomes sandy brown all the way through. Ricotta infornata is popular primarily in Sardinia and Sicily, and is sometimes called ricotta al forno. Ricotta affumicata (smoked ricotta) is similar to ricotta infornata and is produced by placing a lump of soft ricotta in a smoker until it develops a grey crust and acquires a charred wood scent, usually of oak or chestnut wood, although, in Friuli, beech wood is used, with the addition of juniper and herbs. Ricotta forte, also known as ricotta scanta, is produced from leftovers of any combination of cow, goat, or sheep milk ricotta. These are allowed to age for about a year, during which the cheese is mixed every two or three days to prevent the growth of mold. Salt is added as well. The end result is a soft and creamy brown paste which has a very pungent and piquant taste. It is produced in the southern part of the Province of Lecce and sold in glass jars. It is smeared on bread, mixed with tomato sauces for pasta, or added to vegetable dishes. Like mascarpone in northern Italian cuisine, ricotta is a favorite component of many Italian desserts, such as cheesecakes and cannoli. Also, a variety of different cookies include ricotta as an ingredient. Ricotta can be beaten smooth and mixed with condiments, such as sugar, cinnamon, orange flower water, strawberries, and occasionally chocolate shavings, and served as a dessert. This basic combination (often with additions such as citrus and pistachios) also features prominently as the filling of the Sicilian cannoli and layered with slices of cake in Palermo's cassata. Combined with eggs and cooked grains, then baked firm, ricotta is also a main ingredient in Neapolitan pastiera, one of Italy's many "Easter pies". Ricotta is also commonly used in savory dishes, including pasta, calzone, stromboli, pizza, manicotti, lasagne, and ravioli. It also is used as a mayonnaise substitute in traditional egg or tuna salad and as a sauce thickener. Local ricotta is dried in the sun and made into a hard, chewy tablet called chhurpi in Himalayan areas, notably in Bhutan, Sikkim, Darjeeling and parts of Nepal. The fresh, soft chhurpi is the main ingredient in the Bhutanese national dish of ema datshi. It is often used as a substitute for paneer or chena (though the two are not identical) in the Indian dessert known as ras malai. However, paneer is mostly casein protein, similar to cottage cheese, while ricotta is made of all whey protein. While Italian ricotta is typically made from the whey of sheep, cow, goat, or Italian water buffalo milk, the American product is almost always made of cow's milk whey. While both types are low in fat and sodium, the Italian version is naturally sweet, while the American is a little saltier and more moist. In Tunisia, the rigouta from the city of Béja is a close relative to the ricotta, except that it is always fresh-soft and is not aged. It is exclusively made from the whey of Sicilo-Sarda sheep's milk. Rigouta is also used as the basis of several preparations and dishes of Tunisian cuisine. In Spanish, ricotta is known as requesón. It can be salted or sweetened for cooking purposes. It was brought to Mexico by the Spaniards, although it is not as commonly used as queso fresco. It is sometimes used as filling for tlacoyos and tacos dorados, and in the central west area (Jalisco, Michoacán, and Colima) it is spread over tostadas or bolillos, or served as a side to beans. In Portugal and Brazil, a similar product is called requeijão. Romanian urdă (Romanian pronunciation: [ˈurdə]) and Macedonian urda (урда) are made by reprocessing the whey drained from any type of cheese. 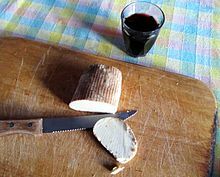 Urdă is thus similar to fresh ricotta as its fabrication implies the same technological process. However, Romanian urdă is neither smoked nor baked in the oven like some variants of the Italian ricotta. Urdă has been produced by Romanian shepherds for centuries and is consequently regarded by Romanians as a Romanian traditional product. Indian khoa is often confused with ricotta, but the two are very different. Khoa is lower in moisture than ricotta and made from whole milk instead of whey. Ricotta is similar to Indian chhena or paneer, and not at all like khoa; it can be substituted for the same in the making of Indian sweets such as sondesh or dishes such as palak paneer, but paneer and chhena are made from whole milk, usually from water buffalo, as the milk is high in fat. The process of making the curds uses citric acid or lime or lemon juice, never rennet. In Greece, very similar to ricotta are anthotyros (ανθότυρο) and manouri (μανούρι), made from sheep or goat milk. ^ "Sargento® Part-Skim Ricotta Cheese". sargento.com. 13 January 2015. Retrieved 22 March 2018. ^ www.weightlossresources.co.uk (2016-04-29). "Calories in Ricotta Cheese". Weight Loss Resources. Retrieved 2018-09-17. ^ a b c d e Kindstedt, Paul (2012). Cheese and Culture: A History of Cheese and its Place in Western Civilization. Chelsea Green Publishing. ISBN 978-1-603-58412-8. ^ "Milk Composition - Proteins". Illinois.edu. ^ "Formaggi tipici italiani: Ricotta Romana DOP" (in Italian). Agraria.org - Istruzione Agraria online. ^ "Official Journal of the European Union". ec.europa.eu. European Commission: Agriculture and Rural Development. 4 February 2004. Retrieved 3 February 2017. ^ "Ricottone - Arthur Avenue Italian Deli". www.arthuravenue.com. ^ Herbst, Sharon T.; Herbst, Ron (2010). The Cheese Lover's Companion: The Ultimate A-to-Z Cheese Guide with More Than 1,000 Listings for Cheeses and Cheese-Related Terms. HarperCollins. ISBN 978-0-06-201155-8. ^ Beresford, T.; Williams, A. (2004). "The Microbiology of Cheese Ripening". In Fox, Patrick F.; McSweeney, Paul L. H.; Cogan, Timothy M.; et al. (eds.). Cheese: Chemistry, Physics and Microbiology. 1 (Third ed.). Academic Press. ISBN 978-0-08-050093-5. ^ Locatelli, Giorgio (2011). Made in Italy: Food and Stories. HarperCollins. ISBN 978-0-06-204727-4. ^ "Ricotta cheese facts and health benefits". www.healthbenefitstimes.com. Retrieved 2018-11-12. ^ "Les filières lait en Méditerranée : enjeux pour un futur durable], Hammamet, Tunisia-Hammamet 26-28 octobre 2000, EAAP publication n°99, 2003, p.102 [117" (PDF). eaap.org. Retrieved 22 March 2018. ^ Jurnalul Oficial al Uniunii Europene - in the Romanian version of the Official Journal of the EU ricotta is translated by urdă (page 4, subchapter 5.3.). ^ Official site of the Directia pentru Agricultura si Dezvoltare Rurala Sibiu Archived 2010-06-03 at the Wayback Machine - Urdă is presented as a traditional dairy product. Fabiano, Guatteri (2012). Formaggi. Conoscere e riconoscere le migliori produzioni dell'Italia e dell'Europa (in Italian). De Agostini. ISBN 978-8-84-187697-8. Ingredients, nutritional and product information. Ricotta cheese composition and characteristics from the Canadian Dairy Commission. Learn about organic cheese making in Abruzzo Italy & how to 'Adopt a Pecora/Sheep to help continue organic sustainable farming in this region .